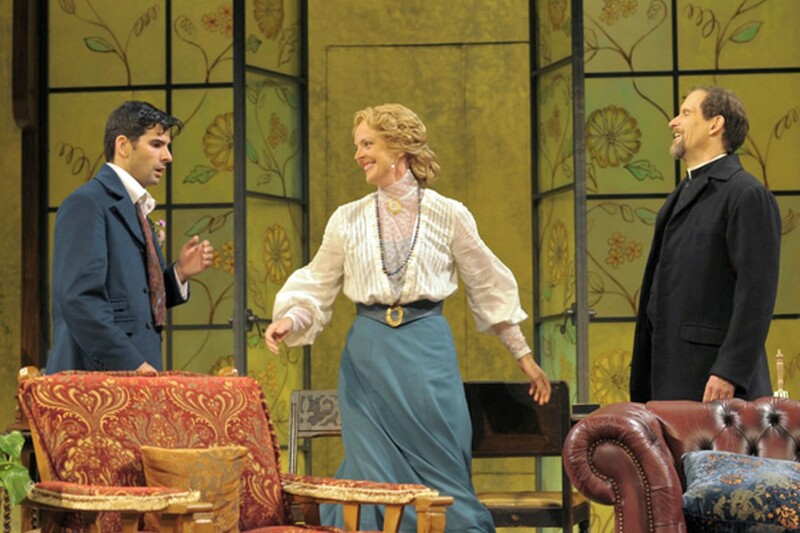 Feminism and class consciousness at Cal Shakespeare Theater, à la George Bernard Shaw. Julie Eccles is a powerful leading actress. George Bernard Shaw wrote Candida at a time when he truly idealized women. Thus, it's a shockingly feminist play — "shocking," given its 1894 publication date — with a headstrong, passionate, borderline-adulterous female as its central character. The whole thrust of the plot is to figure out what women want, whether or not marriage is a form of imprisonment, and if love should ever trump ethics or morality. Those questions remain topical today, as do much of the language and some of the political debate in Candida. California Shakespeare Theater director Jonathan Moscone obviously saw the play's social relevance when he chose to revive it this season, with a powerful leading actress at the helm. Her name is Julie Eccles, and she's the company's current associate artist. She occupies a fairly weird position in the role of Candida, who is supposed to be both a Virgin Mary and a coquette, but also serve as filter for Shaw's social messages. The daughter of a staunch old industrialist, she's married to a Socialist reverend who, for whatever reason, allows her to travel with another man — the eighteen-year-old poet Eugene Marchbanks. Perhaps such things were permissible in 19th-century England, where it would behoove a woman to travel with a male lackey, rather than go it alone. In this case, though, things get complicated. Marchbanks decides he's in love with Candida, and that he's going to rescue her from an insufferably dull domestic life. These characters all represent different shades of Shaw's progressive value system. Candida's husband, the reverend James Morrell (Anthony Fusco) is a well-read Christian populist, who advocates for class equity and fair wages. Marchbanks (Nick Gabriel) is a hopeless romantic and a hedonist, of sorts, since he believes in the pursuit of happiness at all costs. Candida vacillates between Victorian mores and her desire for independence. She becomes a vehicle for Shaw to challenge the predominating values of the era. Because none of these characters are wholly sympathetic nor wholly contemptible, the actors are burdened with showing a fairly broad range of motivations. Eccles, in particular, has to flirt shamelessly with both her husband and Eugene, but always walk away with her chin pointed up and her morality intact. Fusco has to seem humble but dignified; moreover, he has to orate at length without turning into a pedagogue. Gabriel has to play the part of a waifish dandy, but he has to be smart enough for everyone in the audience to take him seriously. They might not pull it off were it not for several minor characters who create the world in which this odd love triangle exists. First, there's Candi's father, Mr. Burgess, who speaks with a pungent working-class accent. Played by Jarion Monroe, he speaks in a gruff bellow, chewing consonants off the ends of words and riddling his speech with malapropisms (e.g., "I always had a thin' for a bit o' potery."). Morrell's secretary, Miss Proserpine Garnett (Alexandra Henrikson) is both a comic foil and an affirmer of the reverend's seductive powers — she melts at the sight of him. Reverend Lexy Mill (Liam Vincent) serves as Morrell's protégé. His job, it seems, is to show how much the reverend is idolized and admired. As Candida points out, Mill imitates Morrell almost to the point of slavishness, even in the way he carries an umbrella or pronounces the word "knowledge." The London that these characters inhabit sits right on the cusp of modernity, but in many ways, it's still locked in the 19th century. The Morrells read mulchy Bibles beneath the light of paraffin lamps, all created, in exacting detail, by set designer Annie Smart. Their house is furnished with oriental rugs, thick candlesticks, an old Victrola, and a crucifix. There's a scullery offstage for cooking and laundering. The men wear spats and waistcoats; the women have puffed sleeves and high-neck collars. As depicted by costume designer Anna Oliver, these fashions all have a stiffness and starchiness that contrasts the dynamism of the characters. And yet, there are exceptions — like Eugene's swishy ascot, or the red dress that Candida wears when she decides to tempt him. Such choices might seem a bit literal, but they still enhance the story. Candida is one of Shaw's Plays Pleasant, a four-part collection that was designed to incite, as well as entertain. It's a comedy of manners with an interwoven class critique: Burgess, the self-made industrialist, must learn how to treat his workers fairly, just as Morrell and Candida must learn to have an equitable marriage. Morrell gets to sermonize about fairness and justice, but, as his wife points out, such ideals come easy to someone who was born into privilege. The ideas that Shaw tried to tease out are all fairly complex, and some are left unresolved at the end of the play. Perhaps that's the point. By today's standards, Candida is a wobbly moral compass. In Shaw's time, she was a provocateur.